Another spoil from Black Friday. I only got it now because I live in a faraway land South East Asia. 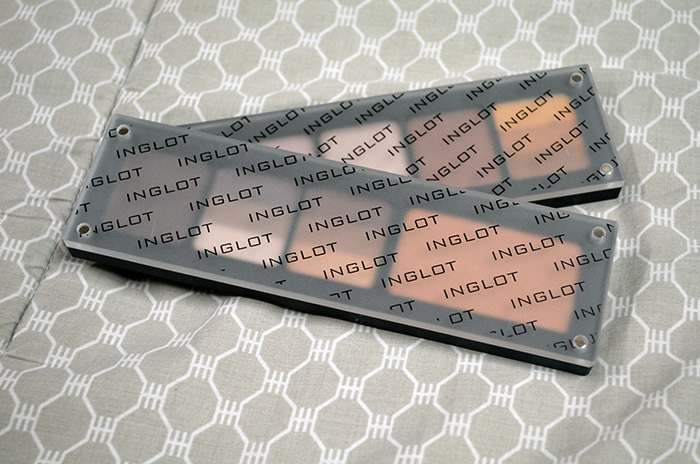 Anyway, I purchased 2 Inglot Palettes and some innards from the actual Inglot site. I was on a ban when I stepped into the Inglot store that just opened here in the Philippines, but I figured I could take advantage of a 20% off sale once I was “allowed” to purchase makeup, so I did. OK, so I got two palettes: one 5-shadow palette, and one blush + 3-shadow palette. I don’t know what they’re actually called, I think just EB and  Square, as indicated by their boxes. The packaging is awesome and sleek. Very minimalist, though I think I’d have preferred the logo to not be patterned over the ENTIRE cover. The cover is frosted plastic that’s pretty heavy-duty, and it attaches to the actual matte black case with four strong magnets on each corner. I predict that this will be a long-ish entry, so I’ll cut it here. First up is the  Square palette, which I’ve filled up with the following eyeshadows: 312, a matte peach, 344, a light matte purple-y taupe, 153, a beautiful taupe (SHINE), 37, a warm chocolate brown (SHINE), and 122R, which is a rainbow shade of three warm, yellow-y browns. It’s in a DS (or “Double Sparkle” finish), which means that is a shadow with a matte base and a smattering of glitter. All of them swatched well, with the shines (153 and 37) being the most buttery and easiest to swatch. I think the mattes are a bit too light for me, but I picked colors that I felt were “lacking” in my current stash that I could also wear the crap out of. This doesn’t seem to be a cohesive palette, but some of the basics I chose to “ground” my choices are to be found in the next palette. Here’s the EB palette, which has space for 1 blush and 3 squares. The typical Inglot purchases have eyeshadows, but I opted to get a brow powder too, so that this could be a takeaway, complete travel palette. Filled in, I have the brow powder in 569, which matches me pretty well, two eyeshadows, 117R, a matte rainbow square with cool brown/neutrals, and 125R, another DS rainbow that has darker warm browns. Lastly, I have a blush in AMC Blush 51, which is actually erroneous. I ordered the 51 Blush from the Summer Collection and was sent this. 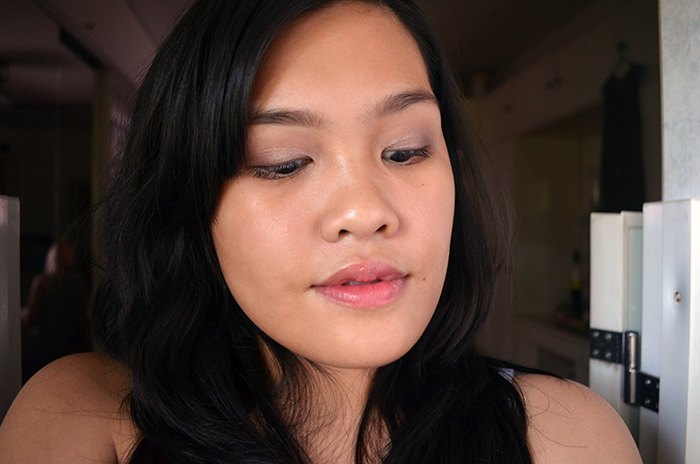 I was surprised at my choice, but it turned out to be a different blush altogether. As you can see, these products are quite pigmented but I’ve learned that that doesn’t mean that products perform well when you actually try to work with them. Here are a few looks I’ve tried out using these palettes for the last few days. I used the brow product on all of the looks here. Look 1: 312 on the lid, the middle shade of 117R on the crease, the darkest shade of 117R on the outer corner over NARS Pro-Prime. Look 2: 344 on the crease, 157 on the inner two-thirds, 37 on the outer third over Benefit Lemon Aid. 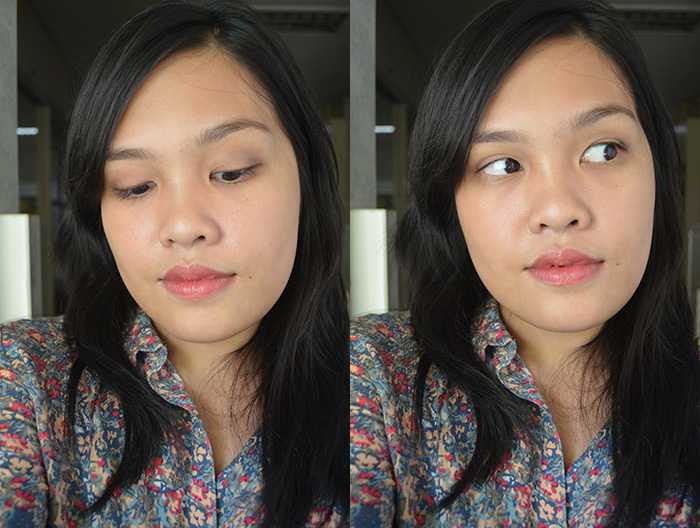 Look 3: middle shade of 122R on outer corner, 312 on the inner two-thirds, third shade of 125R on the lower lash line. Middle shade of 117R on the crease, darkest shade smudged on upper lash line, and lightest shade as a transition color, blending out towards the brow bone. 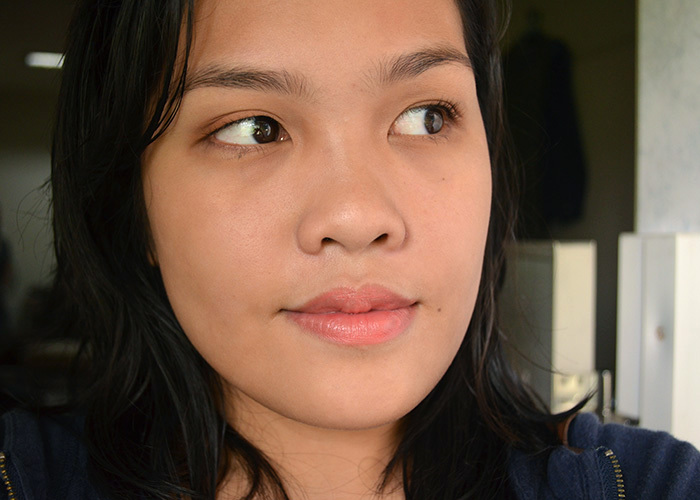 Over NARS Pro-Prime. Another thing to note is that I don’t feel extremely comfortable lugging this around for traveling, or checking it in with my luggage. While the case itself is sturdy, the actual powders feel a little crumbly when I touch my brushes to them. It’s a little disconcerting, but I rarely throw my eyeshadows into my check-in luggage anyway, so I suppose it’s okay? Overall, pretty happy with my purchase. I don’t know if I’ll be purchasing any more eyshadows soon because I feel like it might be overkill to get more when I’ve already gotten so many. I wish I had gotten some greens and khakis or some of the richer purples and pinks, though. 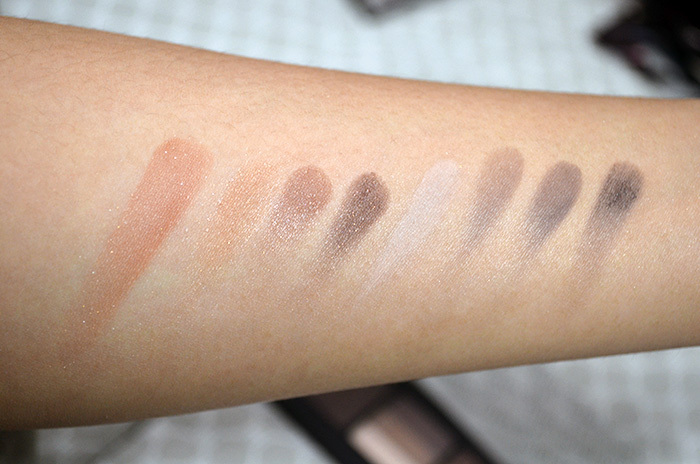 I swatched a few at the store and fell in love. Alas, I am trying to convince myself that the life of excess is not for me. It’s just a little hard when there are so many shiny things within my reach. It’s a pretty cheap brand to explore, though, if you’re only starting to get into “better quality” makeup. 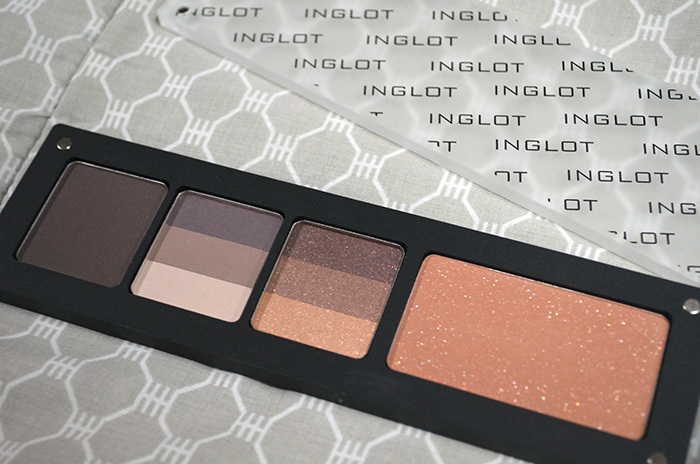 For the quality at its price, it’s really hard to beat Inglot. 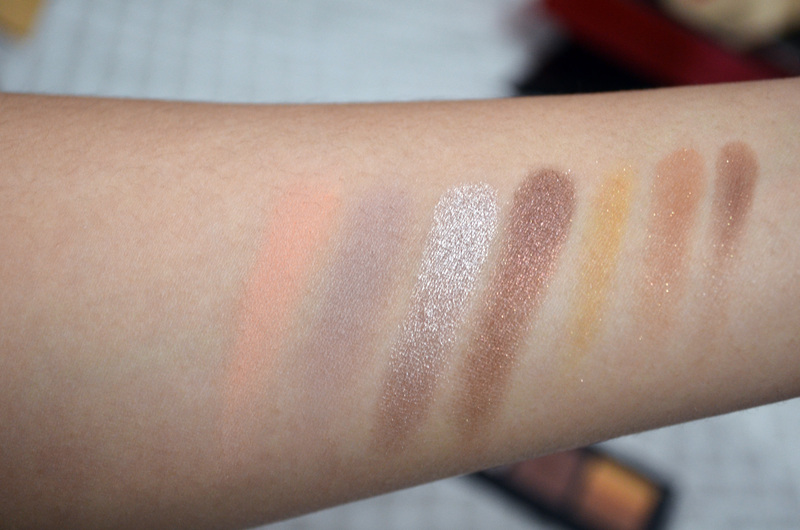 The regular, non-rainbow shadows, I believe, start at Php 375 in-store or $6 online. The pans are very generous with product, too. Are we really going to argue here? Hi Carina, I went to the Inglot store sometime in December and I’m kind of confused with their concept. Do you create your own palette or can you purchase a single pan? Please educate me hehe. Oh I have read somewhere that Inglot has a Betty Bright dupe.. Hmmm.. I heard, too! I’m pretty sure you can purchase single pans. At least, on their website, you can. The second palette is really pretty! I made an inglot palette too! I really like it. The colors you chose are very pretty. No but i plan to in the future! I love the concept, but that numbering system is extremely nondescriptive. I suppose if you have literally hundreds of shades, naming all of them will be troublesome. I think the numbering system would work better if there WAS a system, like hex codes. These just seem random to me. I love Inglot! I actually regret not buying some of the eyeshadows while I was still in SF. 😦 And may we all just look at that 37! Love that shade! 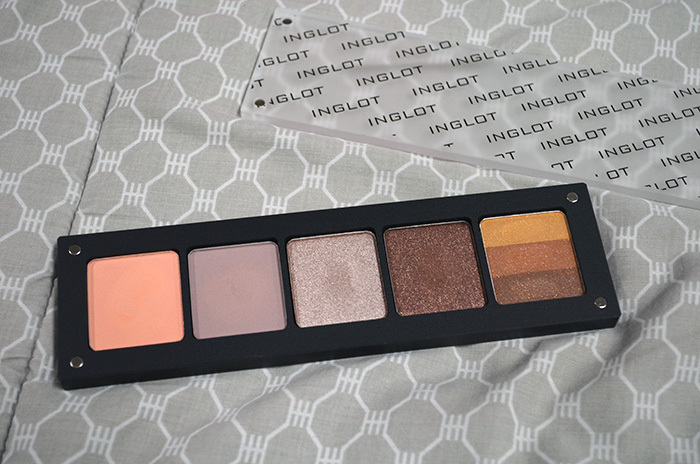 I haven’t tried inglot yet! But i’m happy it’s available locally already! their packaging seems stylish even though it’s minimalist. the ‘shines’ are definitely my favourite but they are all pretty nice. i don’t own anything by inglot next but may have to grab a palette in the future. maybe 2015? haha so much makeup lately, I definitely don’t need more!